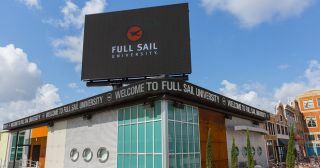 Full Sail University today announced they are working with Daktronics (NASDAQ-DAKT) of Brookings, South Dakota, to design, manufacture and install an outdoor LED video display on the university’s 210-plus-acre campus in Winter Park, Florida. The new display was completed earlier this year and features Daktronics tightest outdoor pixel pitch using 3-in-1 Surface-Mount Device (SMD) LED technology. To date, Full Sail University has the largest Daktronics display of this resolution in the world. The display features 8 millimeter line spacing and measures 17 feet high by 25 feet wide. The SMD LED technology provides a tighter pixel pitch and increased resolution to show crisp, clear imagery with wide-angle visibility for broad appeal as viewers pass by. It’s used to showcase students’ work such as short films, animations, game art, graphic design and more. In addition, the LED video display is utilized for special events on campus including live concerts, film festivals and gaming tournaments and can be programmed to share important campus announcements.